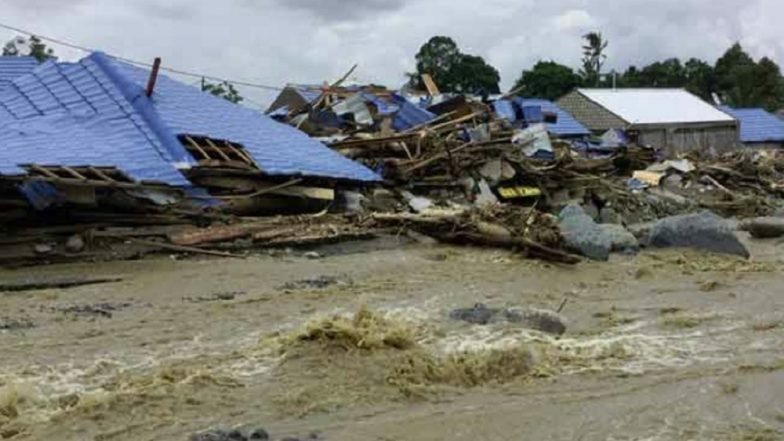 Jakarta, March 18: Sixty-three people have lost their lives in flash floods and mudslides triggered by days of torrential rain in Indonesia's easternmost Papua province, officials said on Sunday. Rescuers were able to pull out 63 bodies from the mud and are still continuing their search operations for the dozens of other people who have been reported as missing. Residents in Papua were caught unawares in the flash floods that struck Jayapura district on Saturday night, Xinhua news agency reported. Al Jazeera quoted National Disaster Mitigation Agency spokesperson Sutopo Purwo Nugroho saying that floods and landslides destroyed houses and roads, along with injuring as many as 59 people as of now who have been shifted to the hospital. The rescue operations in the region are also hampered due to damaged communication networks. Nugroho further noted that the number of dead and injured may increase since many affected areas in the region have not been reached by rescue efforts. "We are overwhelmed by too many injuries," said Haerul Lee, Head of Jayapura (capital of Papua province) Health Office, adding that some medical facilities had been hit by power outages. "We can't handle it alone." Amid the emergency conditions in the region, Papua's provincial administration has declared a two-week emergency in order to get assistance from the Central government. Indonesia's local disaster mitigation agency head Martono said that rescuers have evacuated more than 4,000 people and have shifted them to temporary shelters till the crisis is resolved.